Timaru City Rifles; South Canterbury Mounted Rifles; South Africa War, 2ndNew Zealand Contingent - Quarter Master Sergeant; South African War, 8th Contingent - Lieutenant; Posted to the Militia, 1902. South Canterbury Volunteer Reserve, 1909. Height 5 feet 11 inches. Weight 124 lbs. Chest measurement 33-36 inches. Complexion fair. Eyes blue. Hair grey. Sight - both eyes 6/6. Hearing & colour vision both normal. Limbs well formed. Full & perfect movement of all joints. Chest well formed. Heart & lungs normal. Teeth good. No illnesses. Free from hernia, varicocele, varicose veins, haemorrhoids, inveterate or contagious skin disease. Vaccinated. Good bodily & mental health. No slight defects. No fits. Fit. British War Medal; Victory medal. Imperial South African War Medal with clasps for Johannesburg, Orange Free State, Cape Colony, & Diamond Hill. Leslie George O’Callaghan, born on 6 April 1879 at The Springs, Lincoln, Canterbury, New Zealand, was the second son of Arthur Pyne O’Callaghan and his second wife, Florence née Hindmarsh, of 16 Craigie St, Timaru. His father who was born in 1837 in Ireland and died in 1930, was a farmer and land valuer and served as a Member of Parliament. After attending several schools in the Christchurch area – Riccarton, Lincoln, Prebbleton and Harewood, Leslie entered Waimataitai in 1893 when the family moved to Timaru. From there he went out to work in 1894. His parents lived again in Timaru from about 1910 until 1928. Schoolboy Leslie, signing as “your little soldier”, and some of his sisters were contributors to Captain Kindheart’s page in the Star newspaper, writing mostly of their animals. Leslie George O’Callaghan and Julia Marie Stephanie Wheeler, of Hadlow, Timaru, were married on 20 February 1905 at St Patrick’s, Waimate. Their only child, Florence Marie Hindmarsh O’Callaghan, was born on 15 December 1905 at Waimate. At the age of 20 years and 9 months, LG O’Callaghan enlisted for service in the South African War, for which he was drafted from the South Canterbury Mounted Rifles. At this time he was a clerk in Christchurch for a Timaru employer. His next-of-kin was his father, Arthur Pyne O’Callaghan, of Christchurch. His brother William Arthur O’Callaghan, to whom his pay was to be paid, was living in Auckland. Trooper LG O’Callaghan, 423, left with the Second Contingent. He joined the Provisional Transvaal Constabulary on 21 June 1900 and was discharged on 4 October 1900. The following May he arrived at Port Chalmers by the Tongariro. On 16 December 1901 he made application to New Zealand Defence Headquarters Office, for a Commission in the Eighth Contingent, for which he was well recommended. He was appointed a Lieutenant in this Contingent, effective from 15 January 1902. Again, on 28 January 1902, at Addington, (aged 23 years 10 months) he enlisted for service in South Africa, arriving home this time on 1 August 1902 by the Britannic and transferring to the Mararoa to get to Lyttelton. “He was one of the best all-round men in the Contingent and he filled the difficult position of QM Sergt. with great satisfaction to both Officers and Men of the Contgt. His services as Clerk have frequently been made use of – his work on these occasions being done with neatness and despatch. His general character was very good.” (G. Cranshaw, Major 2nd N Z M R) [undated]. “I have to state that O’Callaghan acted as Squadron Quarter Master Sergeant to the Second Contingent, whilst on Active Service in South Africa, and performed his various duties with the greatest success. I have very much pleasure in recommending his application for above mentioned position, and in doing so have every confidence in his ability to perform any duties he may be called upon to fulfil.” (I have the honour to be Sir, Your obedient Servant Thos. J. Todd, Capt. & Adjt NZMR) [undated]. Trooper Leslie O’Callaghan sent several long letters home to family and friends, writing in some detail of the fighting and conditions they faced in South Africa. He included messages to old friends, especially members of the Timaru Football Club. [See attachment.] Leslie O’Callaghan, as secretary of the Machavie Memorial Fund, took steps to have a monument erected over the graves at Klerksdorp of the New Zealand soldiers of the Eighth Mounted Rifles who were killed in the railway accident at Machavie in April 1902. The officers and men of the contingent subscribed to a handsome marble and stone monument. As a young man Leslie was very much into sports – cricket, football, athletics, cycling. In a cricket match in February 1895, he took three wickets for just 11 runs. This was an area where he excelled for many years. Not only did he play he also assisted with administration. In 1899 he was re-elected secretary of the Timaru Cricket Club. In this capacity he was the one to advertise for a caretaker of the club’s grounds. In 1900 this energetic secretary was absent, serving in South Africa. A feature of the game between Timaru and Waimate played early in 1906 was the bowling of Leslie O’Callaghan, who took seven wickets for 36. His was also the highest score for Waimate in the batting ranks. Two weeks later he represented South Canterbury against Canterbury and, although the South Canterbury team was well beaten, he performed well with the ball. And in March came the opportunity to play against the Melbourne Cricket Club at Timaru. O’Callaghan took some good wickets and a catch off his own bowling, but the team lacked the batting and running prowess of the visitors. He was captain of the Waimate Cricket Club in the 1906-1907 season when, on opening day the captain’s team defeated the vice-captain’s in a friendly match, while his wife provided afternoon tea. Another representative match, in February 1909, saw O’Callaghan featuring again with the ball. Although results were mixed against a better team, he was the best wicket-taker for South Canterbury. In January 1915 Leslie was back on the cricket pitch, playing for the Geraldine Club against a Timaru High School team, and he played a big part in their win, taking eight wickets for 18 runs. Later in the year he turned out for the Timaru Club in a match against the South End Club. His splendid bowling secured nine wickets for 37 runs in the second innings and a win for Timaru. May 1898 saw him riding in the three mile roadster bicycle handicap, under the auspices of the South Canterbury Amateur Athletic Club. He led for about a mile before his brother overtook him and won easily. Leslie also rode in the one mile bicycle handicap, which his brother won. In 1908 he was found refereeing a football match between Zealandia and Taniwha at the Park (Waimate). In May 1915 L. G. O’Callaghan was making his mark in golf. Leslie O’Callaghan embarked on a teaching career, taking up an appointment at Waimataitai School in 1896. That year and the following year he passed the examination for pupil teachers with great credit, and the Gazette of 1899 recorded his success in the teachers’ examinations (Partial D, with special mention in history and geography). After his return from the South African War, he started business as a land, estate and commission agent in Waimate. He was appointed secretary to the Studholme Saleyards Company. And he acted as an agent for other services, e. g. cycles, insurance. He was licensed to sell by auction, and in June 1908 he made his debut at the Timaru skin sales, selling 700 skins “in good style”. Early 1910 he was named as a provisional director of the newly formed South Canterbury Cold Storage and Produce Distributing Company. Soon after a fire broke out in his store in Stafford Street. Fortunately he had insurance to cover the considerable damage to his stock. He was always busy in the commercial sector and active in civic affairs in Waimate and in Timaru after their move. He gained support at a householders meeting in 1914 and offered to receive subscriptions for the endeavours of old pupils of Waimataitai School to raise a sports fund for the school. He was appointed to the South Canterbury Volunteers Reserve with the rank of Lieutenant in 1908, and he was appointed a Territorial Officer (Senior Cadets) with the rank of captain in 1911. He resigned his commission (1908-1912 ) in 1912. In about 1912 his wife drew a ballot for a run at Sherwood Downs, which she named “Leslie Downs” (after her husband). Leslie then moved into farming. In the farming community he was as popular as in business and was soon a leading personality in the district. All too soon New Zealanders were again faced with war. In September 1914 in the Mart (Timaru), which he had founded, he sold by auction two canaries sent in for sale by two little boys of Sherwood Downs, in aid of the Home Relief Fund. They were sold and resold many times, eventually realising £26.10s. Messrs O’Callaghan and LeCren were glad to receive goods for disposal and immediately received offers for the following Saturday. Two weeks later he was picked to play for the Allies against the C.F.C.A. in a fancy dress football match to be played in aid of the British, Irish, and Belgian Relief Fund. He was a committee member of the South Canterbury Branch of this fund. He sold by auction a quantity of extra prime old port, sherry, and chabbis wines, which had been donated in aid of the Belgian Relief Fund, in March 1915 in the Mart. Earlier in the year, in a “neat and very appropriate speech”, he made the presentation to Inspector Cruickshank who was leaving Timaru for Auckland. In May he was in the running for selection to one of two teams to shoot for the South Island Miniature Rifles Championship. Lieutenant Leslie O’Callaghan was present at the second annual meeting of the South Canterbury Ex-Contingenters’ Association, held in May 1915, and he was elected an official. At the Ex-Contingenters' third annual meeting held in May 1916, he was noted as one of the members who had joined the Expeditionary Force. He was a major bidder in the auction (May 1915) of a special composite flag emblematic of all the Entente nations, contributing £5.5s to the Patriotic Funds. In July following at the South Canterbury Savage Club concert, he auctioned some miscellaneous items, which added £5 more to the total raised by the Union Jack auction. He also contributed to the Red Cross fund collection. Mr and Mrs Leslie O’Callaghan were present at another Savage Club performance given in aid of the Red Cross Fund in September. Come April 1916, Mr Leslie O’Callaghan left “his comfortable home and lucrative sheep property” to serve the Empire. He sold his sheep run at Sherwood Downs, as he had received notice that he had been accepted for service with the New Zealand Forces and was to report for duty at Trentham Camp on 2nd May. He also sold his furniture and household effects – “everything necessary in a well-furnished homestead”, the sale being one of the best of its kind held in the Mart. He was entertained by friends at dinner at the Grosvenor Hotel. In proposing the toast of “Our Guest”, Mr W. D. Campbell referred to his sterling qualities and to the esteem in which he was held. He congratulated Captain O’Callaghan on his patriotic spirit in joining the colours and wished him success in his future career. Others spoke in eulogistic terms, to which Captain O’Callaghan suitably replied. The next day many friends gathered to see him off by the express. Leslie’s wife went to Trentham in August 1916, to stay until he left. She and their daughter were then leaving for England. Leslie O’Callaghan, farmer of Sherwood Downs, had enlisted on 2 May 1916, naming his wife (of Timaru and afterwards of London) and his father (of Timaru) as next-of-kin. Shortly after his final leave in Timaru in early September, he wrote from Featherston Camp – “Books and magazines are greatly appreciated during the rather, dull hours on board a transport, and as many of the men of C Company, 18 hail from South Canterbury, I will gladly accept, on their behalf, any bundles of reading matter which your readers may have to spare. If such bundles are addressed to me at Trentham Camp before October 5th, I will receive them in time to distribute on board ship.” In October the Eighteenths paraded to an impressive farewell in the Auckland domain – “the almost silent crowds saw and knew that the rhythmic swing of trained men held a deeper significance than most other sights they have witnessed in their lives. In those serried ranks were sons and brothers, sweethearts and friends, the best of our nation, soon to take their part in the greatest of all wars.” There in command was Captain LG O’Callaghan, who had been posted to C Company of the 18th Reinforcements. After in section there were addresses. “In offering your services, you have been animated by the highest principles – truth, liberty, and justice,” said the Mayor. After afternoon tea and an hour spent with relatives and friends, on the call of Captain O’Callaghan, cheers were given by the soldiers for the citizens of Auckland. By November the Mayor of Auckland had received a letter from Captain Leslie O'Callaghan (Officer Commanding the 18th Reinforcements), which read — “When passing the last point of dear little New Zealand, I tried to send you a message to the good people of Auckland from all the boys on board this transport, but those in charge of the shore station were apparently asleep and consequently we were disappointed. However, it is not too late to thank you all for the very kind treatment and the splendid reception accorded us during our short visit to your city. The warmth of Auckland's greetings will be remembered always.” His father received word [from Captain O’Callaghan] in December (1916), that all on the transports conveying the 18ths were well. At a welcome for returned soldiers hosted by the Timaru Hibernian Society at the Arcade Café on 1 October 1917, Sergeant Michael Sullivan remarked that that he had been wounded while standing one day close to Captain O’Callaghan. Never would he have contemplated that Captain O’Callaghan would fall just eleven days later. All too soon the news came that Leslie George O’Callaghan had been killed in action at Bellevue Spur on 12 October 1917, that dark day at Passchendaele, and exactly one year and one day after he left New Zealand aboard the Tofua. As recently as 4th September he had called at the High Commissioner’s office in London. The news was received in Timaru with profound regret. Yet it did not occasion surprise, for everyone who knew him felt when he left as officer commanding his company that where-ever the fight was hottest there he would be, if not in the front line, as near to it as he could get. “A gallant man, who knew no fear, he had a winsome manner which made a friend for him of each with whom he came in contact. This was so in business, and the men who left for the front under him had nothing but praise and admiration for their leader. . . . . he died as he lived—gallantly, in the service of others.” Mrs O’Callaghan who, with their young daughter, had gone Home was by this time engaged in nursing work in one of the English hospitals. Her widowed mother had moved to Gisborne by the time she received news of her son-in-law’s death. His father, who had been a very constant war worker ever since hostilities started, was still lending very valuable assistance to the Ladies' Patriotic Society with unfailing regularity. In April 1919 he was given a leather brief bag in recognition of his consistent and very valuable work. Later in the same year his mother contributed to the War Memorial Fund. LG O’Callaghan had served on the Waimate Borough Council in about 1908. At the council’s October meeting a vote of condolence with his relatives was carried in silence. Sympathy with the relatives was expressed also at the Timaru Harbour Board meeting and at the Mackenzie County Council meeting. The headmaster of Waimataitai School referred with deep regret to the death of their former teacher. Following his lengthy engagement as a Volunteer in South Canterbury, as an active member of the Studholme Mounted Rifles, in South Africa, and then in World War I, Leslie George O’Callaghan seems to have served in a military capacity for many years of his life, only to be so cruelly knocked down at Passchendaele. M. I. [Margaret Isabel] and M. A. [Mildred Annie] Hickman inserted an In Memoriam notice in 1918 newspapers – “One of New Zealand’s best.” They were the daughters of Thomas Aaron (Tom) Hickman who, after his son was invalided home from Gallipoli, put his age down and went away with the 18th Reinforcements, also being invalided home. Perhaps it was the consideration of Leslie O’Callaghan towards their father which led them to remember. Leslie appeared to have taken a leaf out of Captain Kindheart’s pages in the Star newspaper so many years earlier. More than two months later a letter was received in Wellington from Captain O'Callaghan, C Company, 18th Reinforcements: “Pvt. H. S. (Sam) Simmons, who left New Zealand under my command in C Company, 18th Reinforcements, was not with his company at the time he met his death, but was killed on June 14 near Messines, and buried on the battlefield. Pvt. 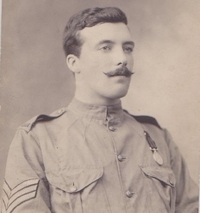 Simmons was very popular with both officers and comrades, and was regarded by all as a brave and daring soldier.” Captain O'Callaghan also stated that the deceased soldier was always cheerful and ready to help any less fortunate comrade in camp and in the trenches, and his death was widely regretted. The Ex-Contingenters’ Association requested the Timaru Borough Council to renovate the inscriptions on the Troopers’ Memorial. When this was done in 1919, additional names were added with this inscription – “This tablet bears the names of the men who served in South Africa and fell in the Great War, 1914-1918.” Ten names were added, including Captain L. O’Callaghan. The annual meeting of the Ex-Contingenters’ Association was held in October 1919, when regret was expressed that so many of their members had “gone West”. Their efforts in compiling a Roll of Honour and in getting the Council to renovate and update the Troopers’ Memorial were also noted. Thanks were extended to the Council. And the members who had made the supreme sacrifice and those who had served were honoured. Leslie George O’Callaghan named his brother, Sydney Robert O’Callaghan, and his brother-in-law, Thomas David MacKenzie, as executors of his will (dated 16 September 1916). Both stated that they had seen Leslie in the uniform of the New Zealand Expeditionary Force and they had sent letters to him and received letters from him while he was on active service. They had also perused the certificate of death. Initially application for probate was not applied for, as they considered it unnecessary to put the estate to the expense, but a year later they were advised to apply, possibly to receive military pay owing . Thus it was February 1922 when the will went to probate. His trustees were also the recipients of his medals – British War Medal and Victory Medal. The plaque and scroll were sent in 1922 to his widow, Mrs J. M. O’Callaghan, care of Timaru solicitors. In 1919 his father, of 20 Craigie Street, Timaru, received the Parchment Commission of his son. It was reported that he was buried at Passchendaele Waterloo Farm. This was one of the dressing stations where the stretcher bearers endeavoured to bring in the wouned. He is remembered on the Tyne Cot Memorial, Belgium, where the hundreds whose bodies were not recovered are honoured. LG O’Callaghan is remembered on many local memorials - Timaru South Africa War Memorial (served in South African War & fell in the GreatWar), Timaru Memorial Wall, Sherwood Downs-Ashwick Flat Memorial, Fairlie War Memorial, St Mary’s Church Memorial, St Stephen’s Anglican Church, Fairlie; Sacred Heart Church, Timaru, and Waimataitai School Memorial; and on the Lincoln War Memorial. The Ashwick Flat Memorial was unveiled in June 1921 in the presence of about 250 people. The National Anthem was sung at the beginning of proceedings, addresses were given by local dignitaries, the hymn “Oh God Our Help in Ages Past” was sung, a prayer of dedication was offered and all gathered joined in the Lord’s Prayer. After the unveiling a piper played “The Flowers of the Forest” and the bugler sounded “The Last Post”. A memorial oak had been planted before the ceremony. Engraved on the west side of this impressive monument are the names of seven men who fell in the Great War, Captain LG O’Callaghan being one of them.